Orbital 002 Hot off the heels of their successful first release ‘Opposite Visions’, Orbital London make a second statement with ‘Coopers Dubz EP’. Sidewinding in on the A side is label front man, Jack Michael. ‘Never Said That’ is a familiar sound we have come to expect from the young talent, warm, and born to be heard loud. A bit lighter on its feet, with a definite spring in its step is fellow UK artist Harry Wills’ interpretation of ‘Never Said That’. Juicy by name, and juicy by nature. Kicking off the B side with a ‘Clout’ is Wills again, with a much darker outlook. A tight garage groove that packs a punch. Returning the remix favour is ‘Jack’s Dusty Mix’, a mysterious and pacey affair to round off the Dubz. A four track release, fulfilling all of your bassline requirements. Big up Cooper. 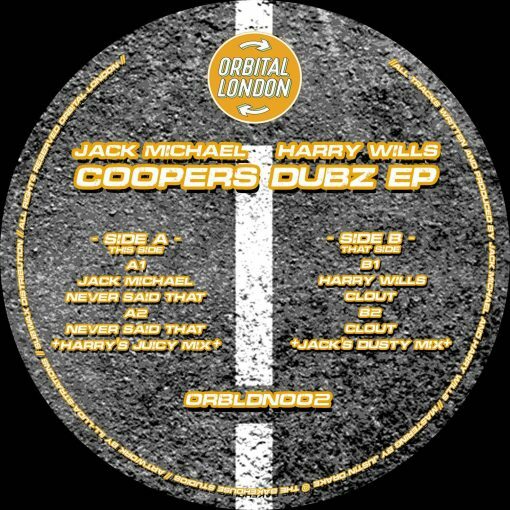 More items from " Orbital London "
More items from " Harry Wills | Jack Michael "